Turn the stovetop to medium - high heat and add 2 tsp of Olive Oil. Add the Vidalia onions and the leaves from the sprig of thyme. Sauté until the onions are transparent. Chop the cucumbers into chunks about 2-3 inches apart. If you want to achieve the pale green color like I have above then peel the cucumbers before chopping them into sections. Dice the Celery into 1/2 inch pieces. Add the Cucumber, Celery and Cilantro into a blender. Squeeze half of the lemon into the blender. Turn the blender on and Puree the mixture. If you have trouble getting the cucumber and celery to blend then add some water to help loosen the mixture up. Take the celery cucumber mixture and pour into your serving dish. Add the diced radishes and thyme onion confit to the top. Add the lemon zest for garnish. You can serve this gazpacho at room temperature or chill before serving. Enjoy. If you're short on time, money and want something a little healthy then try making this dish. You won't be disappointed. It's perfect for pot lucks, bbqs or impromptu dinner parties. Plus you can use the extra cucumber for an at home spa treatment. 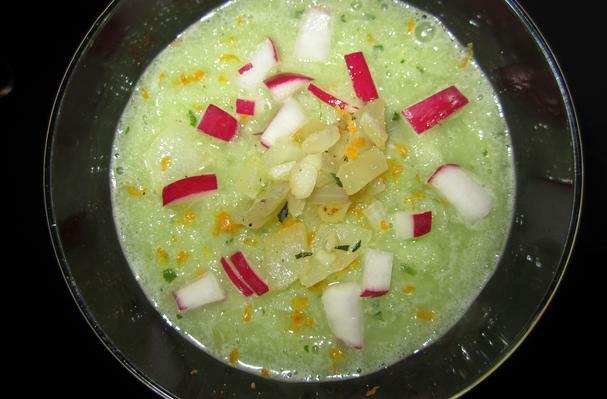 Gazpacho is an ancient cold based soup- salad like mixture. Initially, it was known as the poor man's soup. Coming from the moz-arab word caspa, meaning to break apart or residue; its origins are said to be traced back to the Arabs who originally made the soup with bread, olive oil, water and garlic. It was later introduced to Spain where it was quickly embraced into its' culinary lineage. Tomatoes, which initially were used as a decorative plant for fear that they were poisonous, were added in the 1700's along with vinegar. Thus creating the well known Andalusian - Spanish version of gazpacho. But gazpacho has continued to evolve and has adapted to include various different ingredients. Cucumbers, notoriously known as a beauty remedy for your eyes also offer many health benefits. Because of their high potassium, silicon and sulphur content they regulate diabetes, blood pressure and promote hair and nail growth. They also fight against teeth, gum, kidney, urinary, liver and pancreatic disease.